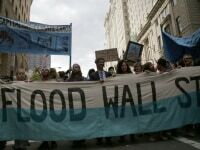 On Monday, a day after an estimated 300,000 to 400,000 people participated in the People’s Climate March in New York, a smaller group of activists set out to shut down Wall Street. The day began with a festive atmosphere, and ended with clashes between protesters and police, who dispersed pepper spray and made dozens of arrests. Some of those arrested had planned on being detained as an act of civil disobedience; others were caught in the fray as tensions heated up during the afternoon. 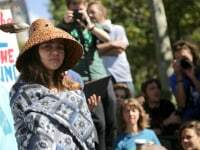 Earlier in the day, heirs to the Rockefeller family — which made its vast fortune from oil — announced their philanthropic organization is to sell off their investments in fossil fuels and reinvest in clean energy, joining a growing global initiative called Global Divest-Invest. 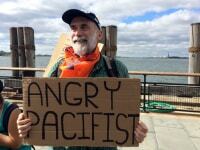 The day’s events began with a rally, dubbed “Flood Wall Street,” in Manhattan’s Battery Park. 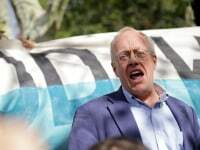 Authors Naomi Klein and Chris Hedges, as well as several grassroots activists from parts of the world that have already felt the acute effects of global warming, fired up a crowd that organizers said numbered between 2,000 and 3,000. The atmosphere was reminiscent of the mostly dormant Occupy Movement — and it was clear that many of the activists were veterans of Occupy Wall Street. Speakers used a “human mic” to get the crowd up to speed on the strategy for the day, with one individual shouting instructions and the crowd repeating them back for everyone to hear. 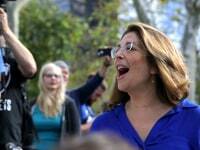 Organizers planned a series of maneuvers that they hoped would bring them to the heart of Wall Street. “I’m a botanist professionally, and I work on endangered native plant species, and climate change is having a big effect, said 52-year-old Richard Lynch. “And it’s not just rising sea levels — the fauna and flora of our country is changing. 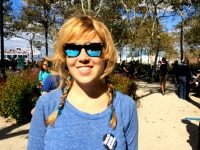 And as someone who cares about these issues, I felt that I needed to be here.” Lynch said that he had been arrested 15 times during three years with Occupy Wall Street. As the protesters left Battery Park shortly before noon, they immediately began a game of cat and mouse with police. They quickly abandoned the route that officers were directing them to take, dodging along Broadway through morning rush-hour traffic. They reversed course several times, forcing police and the media to catch up. 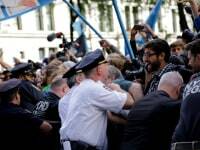 But police appeared to have been prepared for the maneuvers, and the crowd soon found themselves penned in near the iconic Wall Street bronze bull, a couple of blocks south from where Wall Street intersects with Broadway. For several hours, thousands of activists sat down in the middle of the street, on either side of the bull. They spoke, chanted slogans and sang. A man in a polar bear suit made an appearance. The situation appeared calm. 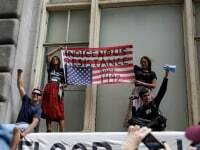 Then, at 3:30 p.m., one demonstrator suggested via the human mic that the group, which had dwindled in size but was still several-hundred strong, pick up their banners and move north, toward Wall Street. The crowd advanced, with a growing number of police moving ahead of them on foot and motorcycles. 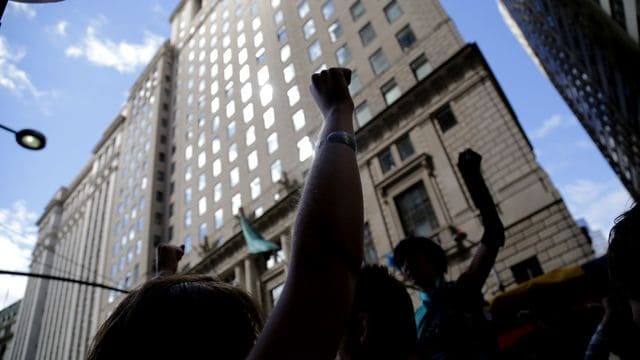 When the demonstrators attempted to turn onto Wall Street, the police locked metal barricades into place, while mounted officers waited along the narrow cobbled road that ran toward the stock exchange building. The protestors pushed against the barricades and the police pushed back, resulting in a struggle that lasted for several minutes during which the police received reinforcements dressed in riot gear. 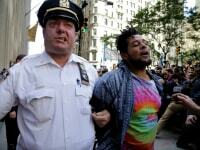 A few demonstrators were hit with pepper spray, and a few others arrested. But the mood soon quieted. Pizza appeared, and some protestors threw baking soda, dyed blue, into the air, to represent the “flood” that did succeed in shutting down several blocks of Broadway and a corner of Wall Street, frustrating those who worked in the neighborhood as they fought their way to the subway following the closing bell. By 6:30, police gave an order to disperse. The few dozen protestors who remained after the warning were arrested and walked one-by-one to a police bus waiting nearby.